A Client Name Sub Head Banker Info Banker Title MERGERS & ACQUISITIONS BUSINESS VALUATION CORPORATE FINANCE MARKET INTELLIGENCE Investment Bankers To The. 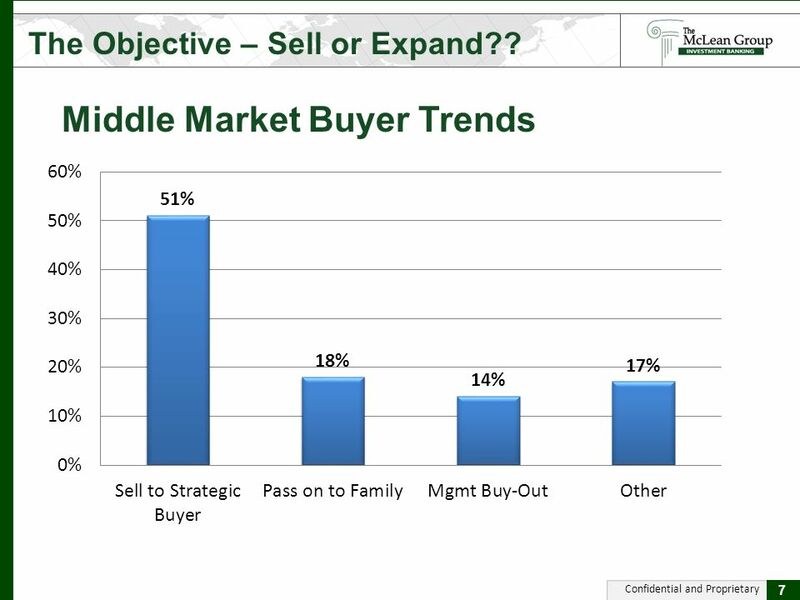 8 Confidential and Proprietary Recaps – Sell Some, Expand Some The Objective – Alternatives 8 Take some of the current investment off the table, provide new capital, take business to new level. Capital sources may require equity of 25-75%. 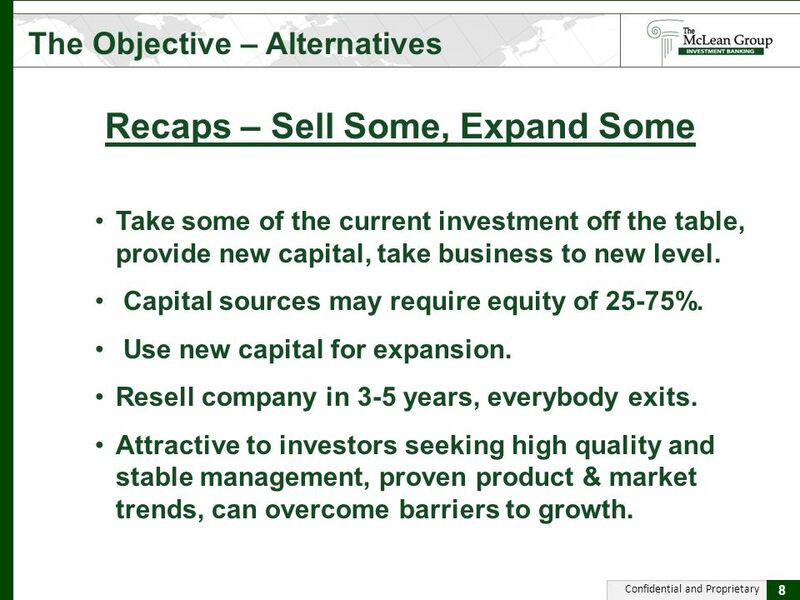 Use new capital for expansion. 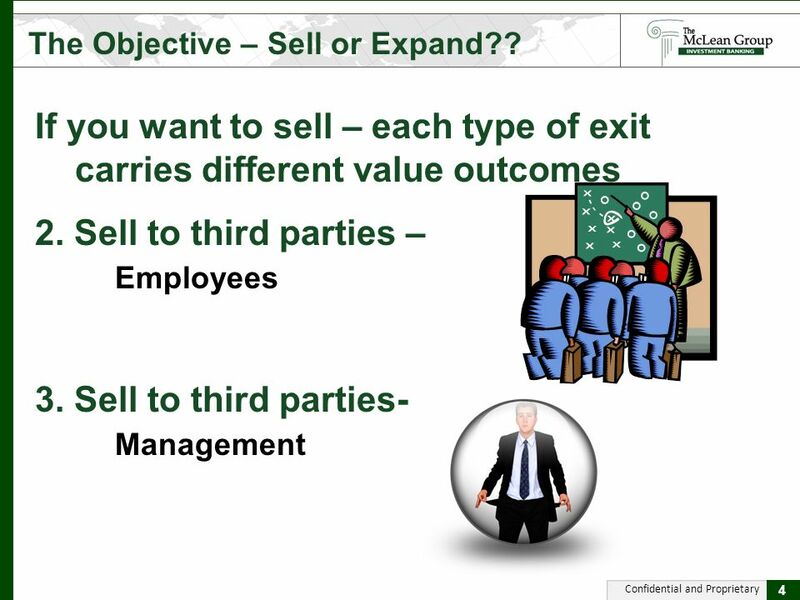 Resell company in 3-5 years, everybody exits. Attractive to investors seeking high quality and stable management, proven product & market trends, can overcome barriers to growth. 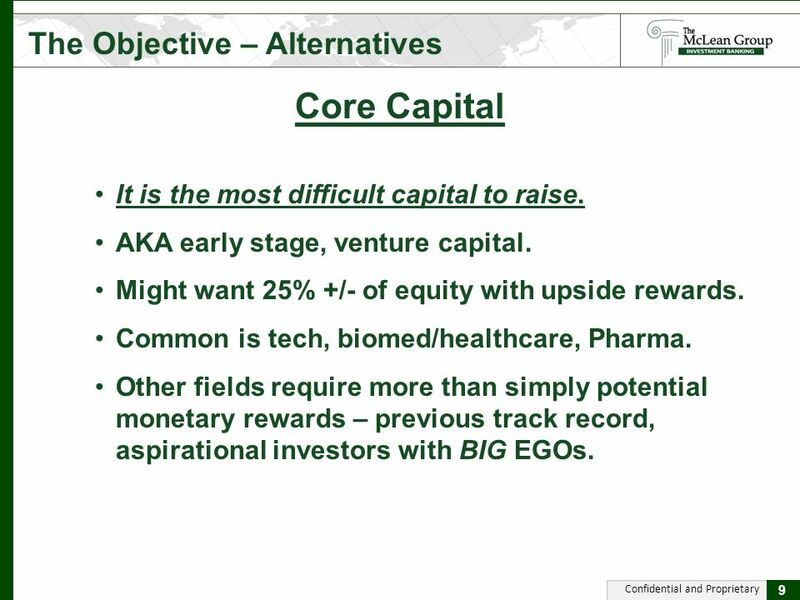 9 Confidential and Proprietary Core Capital The Objective – Alternatives 9 It is the most difficult capital to raise. AKA early stage, venture capital. 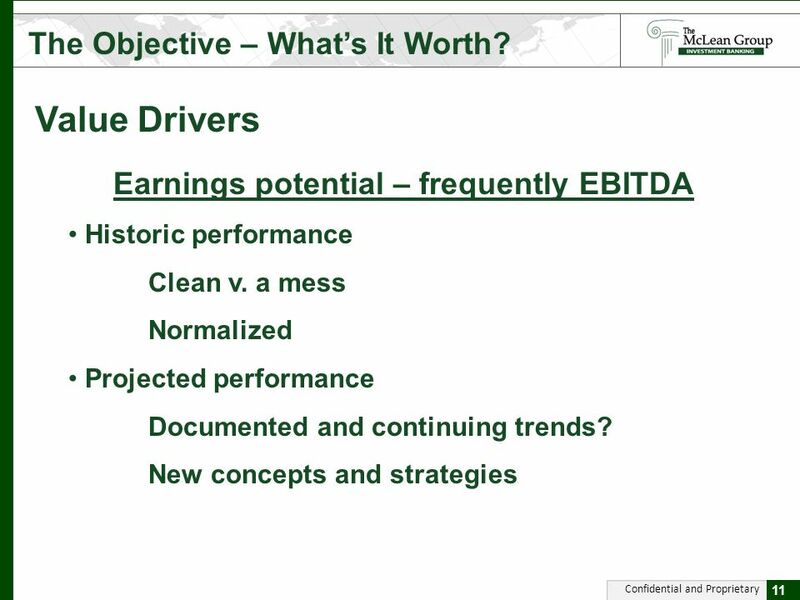 Might want 25% +/- of equity with upside rewards. Common is tech, biomed/healthcare, Pharma. Other fields require more than simply potential monetary rewards – previous track record, aspirational investors with BIG EGOs. 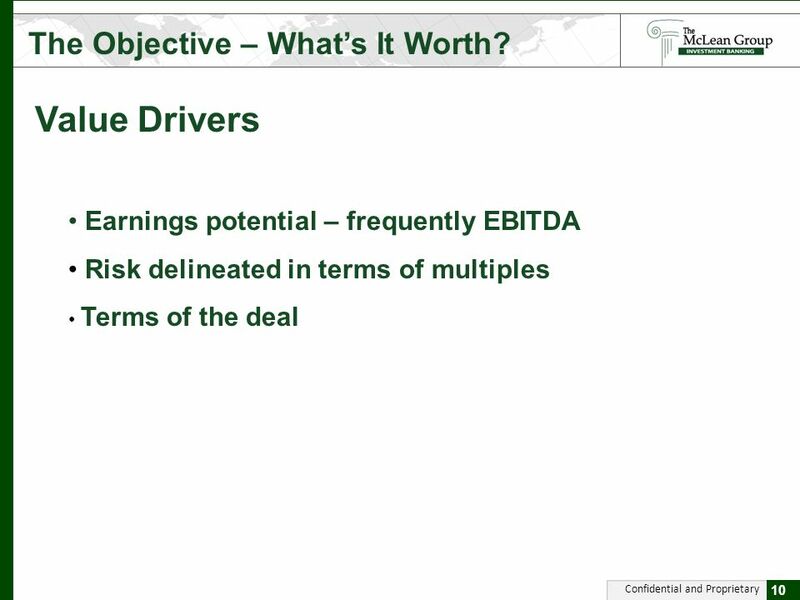 12 Confidential and Proprietary Value Drivers The Objective – Whats It Worth? 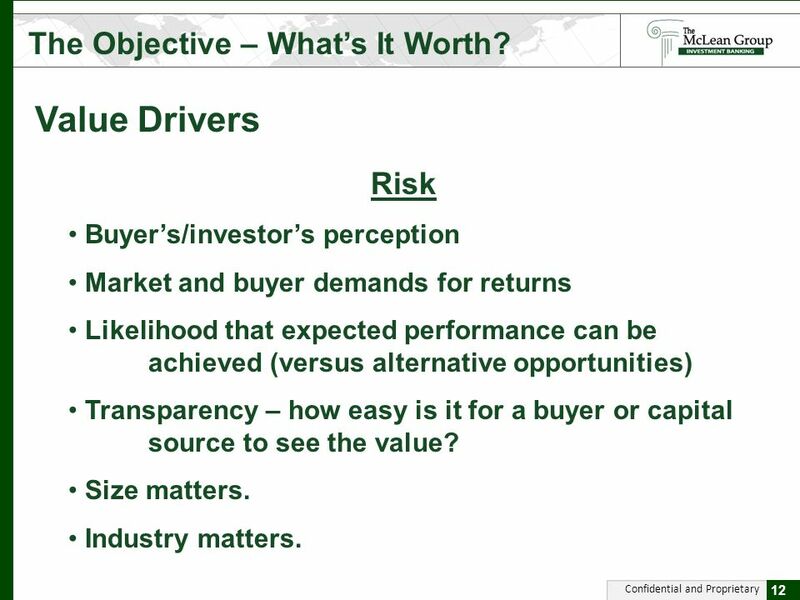 12 Risk Buyers/investors perception Market and buyer demands for returns Likelihood that expected performance can be achieved (versus alternative opportunities) Transparency – how easy is it for a buyer or capital source to see the value? Size matters. Industry matters. 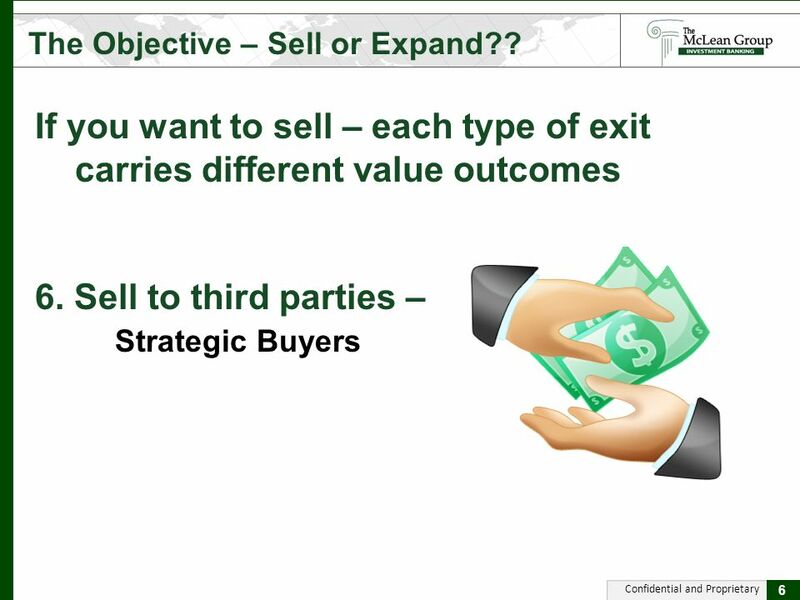 14 Confidential and Proprietary How Can I Enhance Value?? 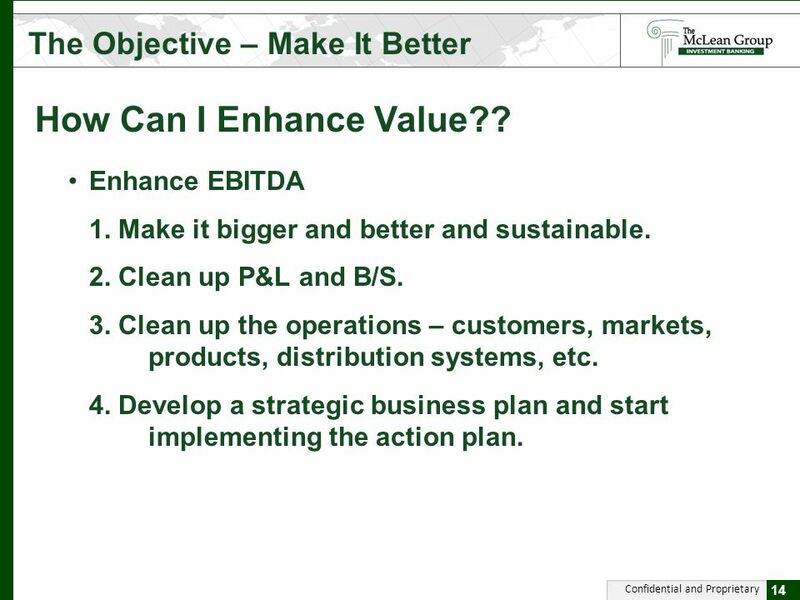 The Objective – Make It Better 14 Enhance EBITDA 1. Make it bigger and better and sustainable. 2. Clean up P&L and B/S. 3. Clean up the operations – customers, markets, products, distribution systems, etc. 4. Develop a strategic business plan and start implementing the action plan. 15 Confidential and Proprietary How Can I Enhance Value?? 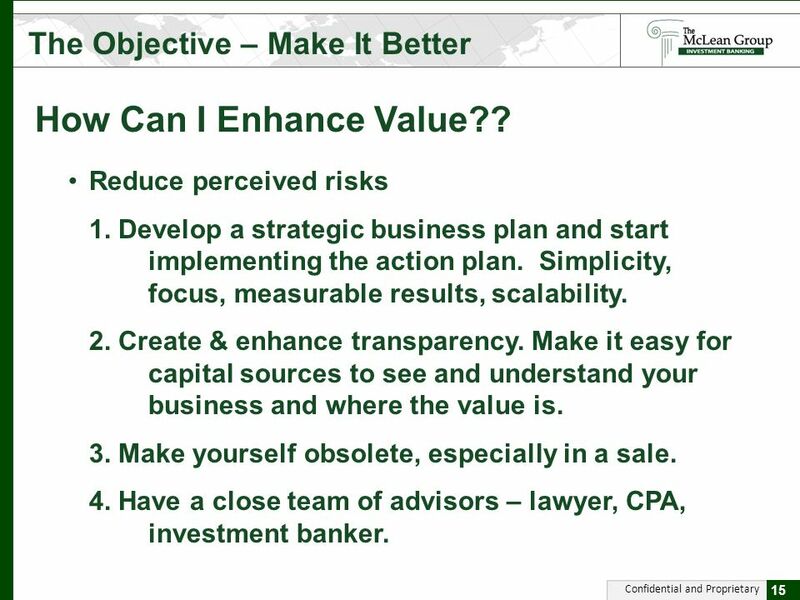 The Objective – Make It Better 15 Reduce perceived risks 1. 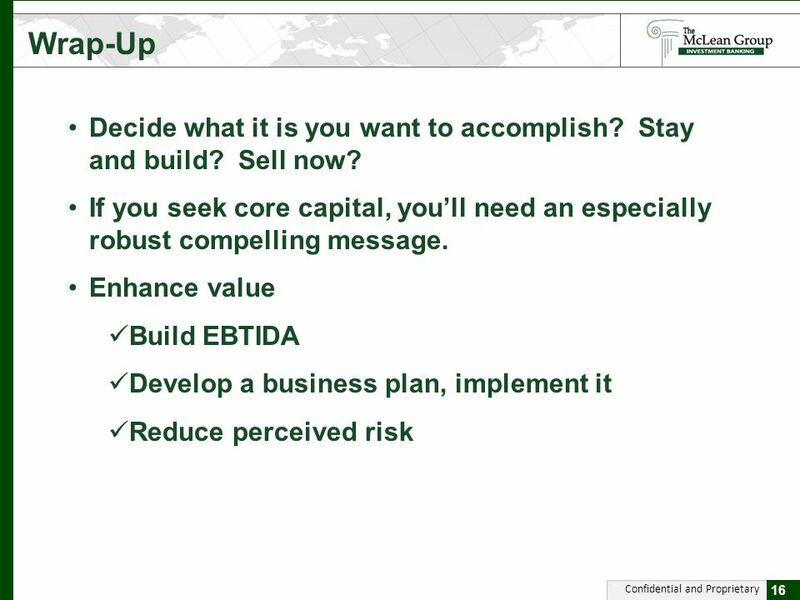 Develop a strategic business plan and start implementing the action plan. Simplicity, focus, measurable results, scalability. 2. Create & enhance transparency. 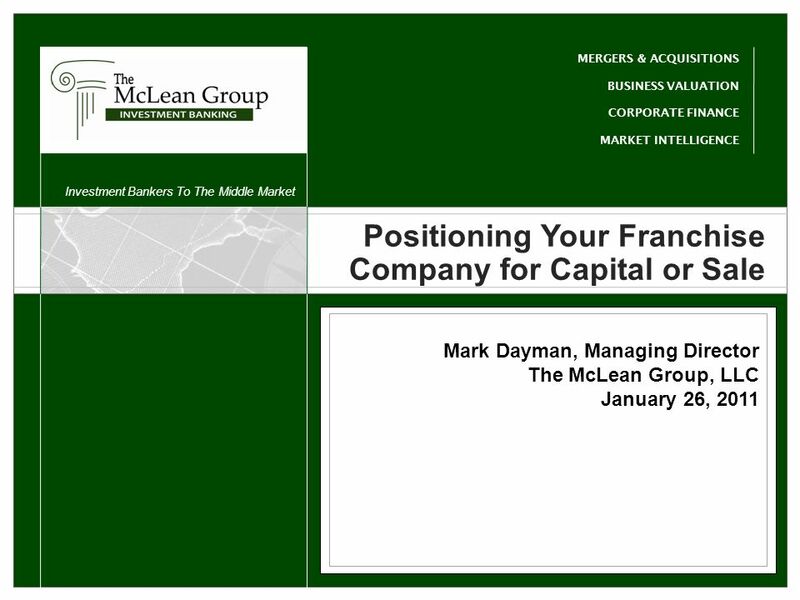 Make it easy for capital sources to see and understand your business and where the value is. 3. Make yourself obsolete, especially in a sale. 4. Have a close team of advisors – lawyer, CPA, investment banker. 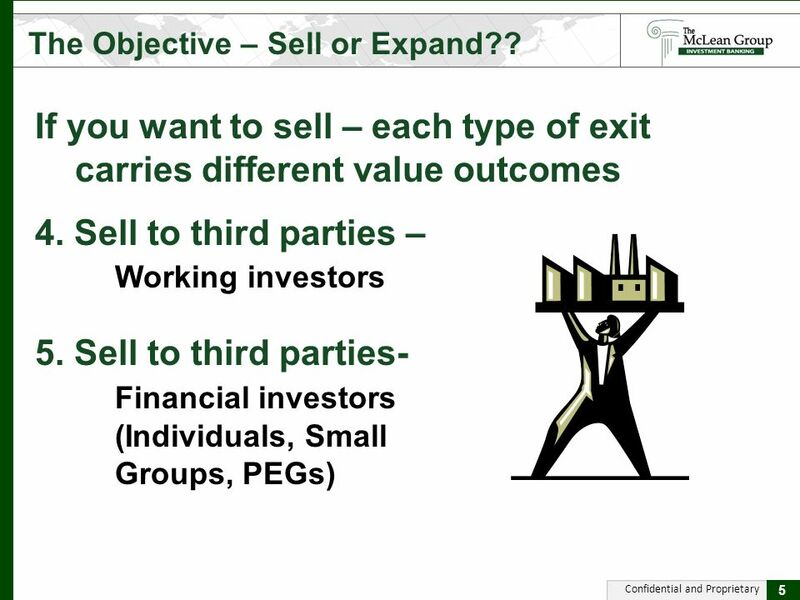 Download ppt "A Client Name Sub Head Banker Info Banker Title MERGERS & ACQUISITIONS BUSINESS VALUATION CORPORATE FINANCE MARKET INTELLIGENCE Investment Bankers To The." Technology Commercialisation System Richard Linley Associate Consultant. PRIVATE EQUITY: INDIAS GROWTH CATALYST BY J. MAITRA & ASSOCIATES. Growth Strategies in a Tough Economy Venture Association of New Jersey February 17, 2009 Chris Sugden, Managing Partner. REALTY KNOWLEDGE ARBITRAGE ADDING VALUE THROUGH AT LandSmiths Projects Pvt. Ltd. Credentials Statement. Copyright © 2009 The McGraw-Hill Companies, Inc., All Rights Reserved. McGraw-Hill/Irwin. 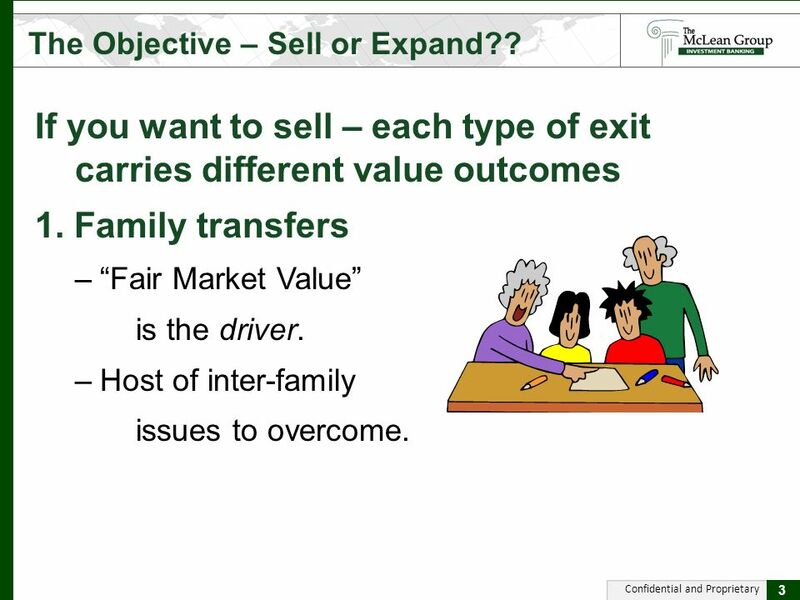 Explain the importance of having a harvest, or exit, plan.